Sixty five members and guests of Clyne Heritage Society attended the Society’s 2007 Summer Exhibition opening in Brora Library. 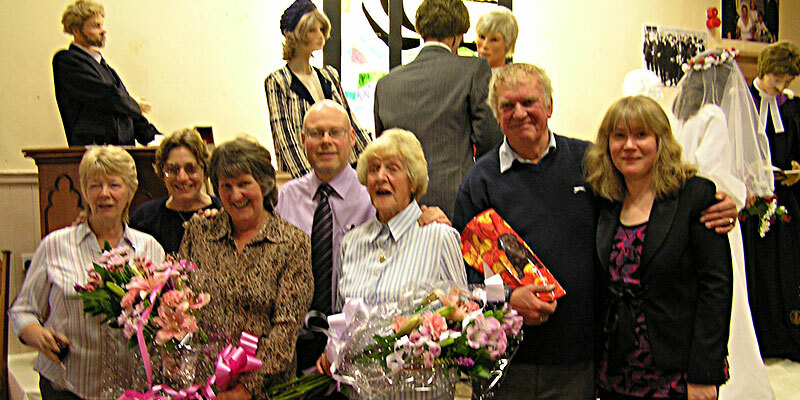 The 9th successive annual exhibition staged by the Society is this year entitled ‘Churches in Clyne’, and was officially unveiled by special guest, Hetty Cunningham. The exhibition covered all five denominational churches in the parish: Church of Scotland, Free Church, Roman Catholic, Episcopalian and the United Free Church (now amalgamated with the Church of Scotland), and considerable assistance was given by the Ministers and their congregations. The stunning centrepiece tableau depicted aspects of the churches functions. Dominating the stage from the rear wall was a brilliantly backlit life-size stained glass window, meticulously and artistically created by Betty Faassen de Heer, as was the rest of the stage set. Life-size mannequin models depicted themes from the different churches and their functions. The display included a Free Church preaching scene, a Roman Catholic christening, a Church of Scotland wedding and an Episcopalian Minister and choirboy. The death scene was non-denominational and featured Old Father Time, sickle in hand, warning an unsuspecting whisky drinker that he might end up as Jock MacTavish (deceased), as depicted on the headstone on the adjacent grave! The display boards showed fascinating photographs collected by the Society and loaned and donated by members and friends of the Society. The present day photographs of all of the parish places of worship and burial grounds set the scene, and some of the most interesting of the older images were of the huge gatherings which occurred for the church Sunday School picnics around a century ago. One of these groups of around 100 children and accompanying adults from 1927 at Loth Station, featureed a young Hetty Cunningham and Rob Wilson, both current members of the Society. There were photographs of Sunday School sports days at Gordonbush and outings to places such as Dunbeath in the 1950s, and more recent Sunday School outings. There were photographs of Church celebrations over the years and potted histories of all of the local churches. The new display cabinets held a host of important and fascinating artefacts, both donated by parishioners and also held by the Society, including communion tokens, goblets, plates and bibles. There are still some gaps in the texts on the photographs, so the committee would appreciate any further information about these. The exhibition was open for all to see during normal library opening hours (tel: 01408 621128) and ran continuously until April 2008.